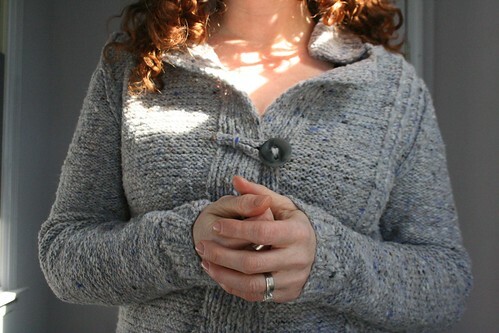 knitted :: Mulled Cider, originally uploaded by earthchick. 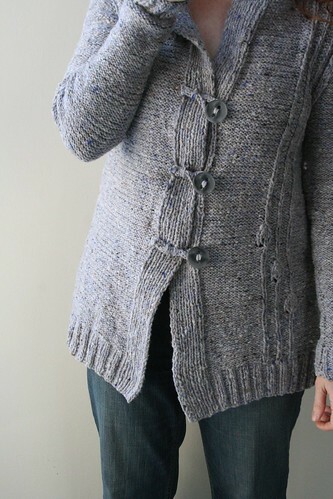 When I met Thea at Rhinebeck last October, she was wearing the awesomest tweedy jacket, her own design: Mulled Cider . I couldn’t get over it – the details were so unusual and beautiful. After the weekend was over, I couldn’t get the sweater out of my head. I emailed Thea and begged to be a test knitter. It took me longer than it should have to knit it (Christmas knitting interrupted, and then I accidentally knit one of the fronts in the wrong size, etc., etc., you know how it can go). And then it took me even longer to get good shots of it (first there was zero degree weather, then I came down with strep throat). Now the pattern has been out for a month, and here I am finally blogging it. I am ridiculously thrilled with this knit. It is so unlike anything I’ve made or anything I own. It is the perfect combination of cozy and stylish. I love it that it’s so warm without being bulky or frumpy. 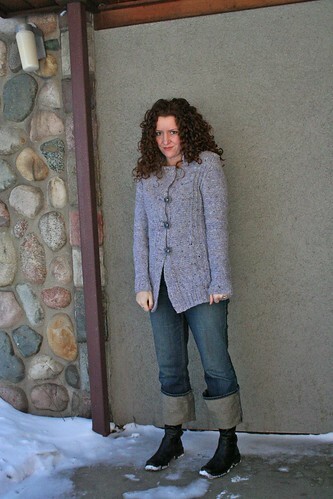 I knit this in (the sadly discontinued) Classic Elite Skye Tweed, which blocked out so beautifully. I bought a pile of this yarn on closeout a few years ago, and this gorgeous grey was originally slated to be a sweater for My Old Man. The fact that I’d stashed it for a man’s sweater meant I had just enough for a long jacket. This took about 11 skeins (about 1200 yards). 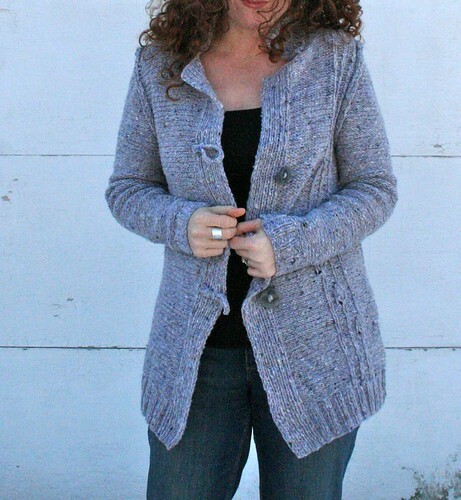 I loved it in the rustic brown that Thea knit hers in, and I’m crazy for it in this soft grey. Wouldn’t it also be fantastic for spring in a light green or soft yellow? But honestly? It’s just the whole package that I love. It is the perfect little layer, and I adore it. Wow, I love it, too! Nice work, Stacey. Oh my, that is stunning. I might have to make one of my own! You nailed it mama! Superb. 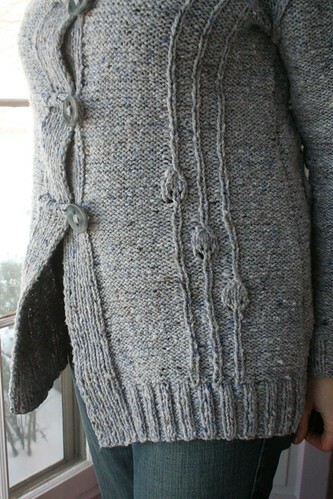 What a beautiful knit!! It really does look like a very cozy, wearable and stylish sweater. I love it, and I want to knit one for myself. I loved this pattern the minute I saw it too. 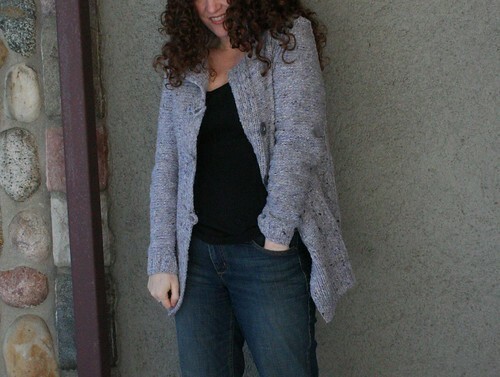 I really like it in the gray you picked – it looks fantastic on you too! Its beautiful. I have to agree, I love the vine detail on the back! 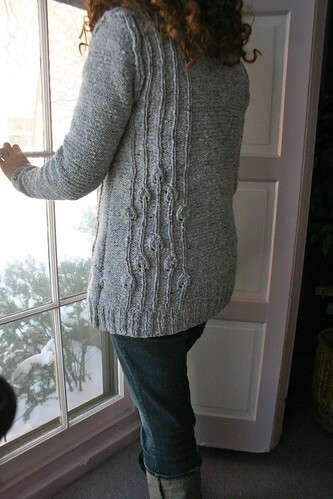 Love your sweater – she has great patterns. Just wanted to say thanks though for the Awbrey cowl pattern!! This weekend myself, my son’s girlfriend and one of her friends are heading to my daughters to learn how to cable and we are going to be using your cowl pattern. We can’t wait. I have never tried the Russian lace bind-off, so I’m going to give that a try also. Thanks for your inspiration!! Its stunning. I even have to agree, i really like the vine detail on the back! I loved this pattern the minute I saw it too. 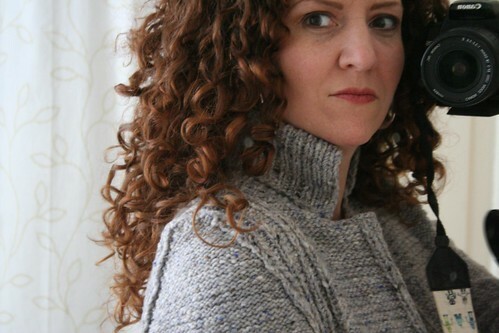 i actually love it within the grey you picked – it’s fantastic on you too! Beautiful! The yarn fits the pattern absolutely perfectly! It does look very cozy, and also very stylish! I love the vine details too. I always yearn for the perfect combination of cozy & stylish. You’re right — totally achieved it here! 🙂 I love the loop style buttons, too! Wow, your mulled cider looks awesome! I’m over big sweaters at the moment… I’m finding quick accessories more my speed at the moment, but this may be in my queue in time for fall. I love the leaf details. If I wasn’t struggling to finish a vest I’d cast on this minute. But I’ll behave…..
Oh that is stunning! It looks terrific on you!